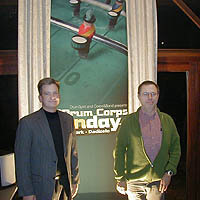 Brian Hickman and François Deschacht at DCI Fan Day in Belgium. Brian Hickman, executive director for the Glassmen, recently took a three-day whirlwind tour of France, Belgium, Netherlands and England to finalize the details for the corps' upcoming summer tour of Europe. The highlight of the weekend was a special presentation about the Glassmen that Hickman did in Dadizele, Belgium, for hundreds of very excited drum corps fans at "DCI Fan Day." "The weekend was a definitely a whirlwind with all the travel, but it was a great opportunity to meet our hosts for the summer tour, and start laying the seeds for what is to come in June. This is going to be a great opportunity for our members and for the entire Glassmen organization as a whole," said Hickman. Meanwhile, the Glassmen Web site has undergone a complete facelift. Check it out for news, including scholarship announcements!